DBZFanGoten is an author who started out on Writing.com back on November 5, 2010. Has written stories for himself, and help work on existing stories on the website! Some of his stories or collaborations can be read here below, on Gotenboner. 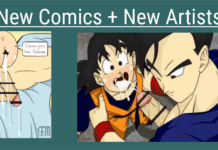 We are actively collaborating with DBZFanGoten for new ideas and stories. We love the stories written by DBZFanGoten and will continue to enjoy them as they are published here. =) Hope you enjoy the stories! Make sure to leave feedback and a rating!